Update: The powers of hacking, modding, and homebrew have come through! Here's how to play online after Nintendo's servers are offline. As of May 20, 2014, the online service used by most DS and Wii games, the Nintendo Wifi Connection, will be shut down. It's a sad day, since I had a lot of good times on many of the games that use Nintendo WFC. So here's a tribute to all of my favorite online Nintendo games since November of 2005 when the service started. The year leading up to Mario Kart DS filled the Nintendo NSider Forums with hype for online gaming and the boards were fraught with baseless rumors and potential hacks that promised to get the DS online earlier than the official service. None of them followed through (except for a trick that allowed you to download demos wirelessly from a PC), so when the first online game was released, there was much rejoicing. I didn't yet have wireless internet at my house, so I took a walk around the neighborhood in an attempt to steal someone else's internet. It didn't work, probably because the servers were down on release day, but we soon got wireless internet of our own and I spent many hours racing online, perfecting snaking, designing my avatar (a picture of a Fawful, detailed pixel by pixel), and competing with internet friends from around the world, namely Wario7, who was a beast at PRBing (prolonged rocket boosting). Out of every Mario Kart game, this was the one that I put the most time into and it was all thanks to online play (and all of my friends having it). As a Metroid game, Metroid Prime Hunters was a disappointment for me in the single player department. But as an FPS, it was more fun than I could've imagined a game being on a handheld system at the time. Online multiplayer was a blast to play and, once again, my friends and I played the heck out of it, mastering each map and getting good with particular characters (Sylux and Trace for me). 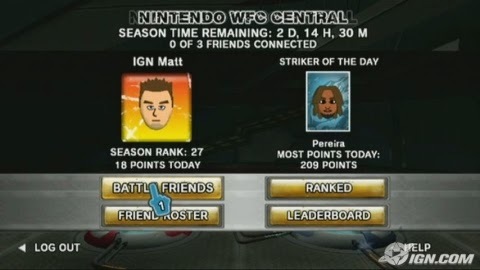 This game also had lots of stats available, not just in-game, but viewable on the official Nintendo WFC website, which could be used to see your stats and your friends' stats. Unfortunately, as time passed, the online multiplayer degenerated into an arms race of figuring out the many exploitable glitches and worse, outright cheating with Action Replay. 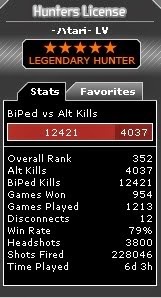 Still, it was one of my favorite online gaming experiences and I'm not even that into FPS games. 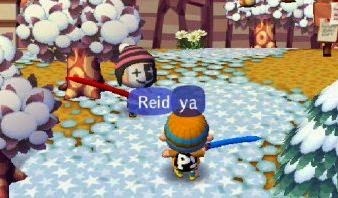 My sister and I were pretty obsessed with Animal Crossing on GameCube, so when Wild World allowed us to visit other towns online, I, at least, was thrilled. The fun didn't just end with hanging out and fishing with friends; playing online became the biggest money-making opportunity in the game. I would buy as many turnips as I could, then sell them in a town with high prices, or, when my town had high prices, I would allow others to sell in my town for a percentage of their profits. Then there was Nookbay, an auction site styled after eBay, but for buying and selling Animal Crossing items. 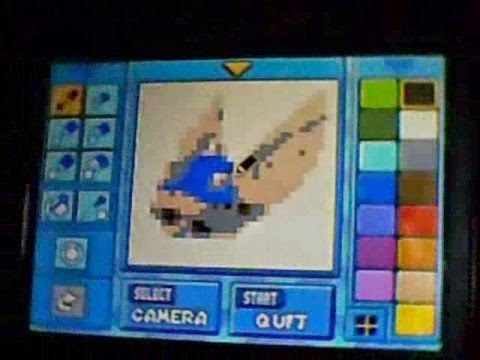 Since regular items could easily be hacked in with Action Replay, hand-made patterns were a hot commodity and I made bank designing and selling these. And while cheating did devalue regular items and later even made it possible to destroy other people's towns, it also made available "not used" items like invisible chairs and, in City Folk, hacked DLC like lightsabers. Some people with AR even held events in their modified towns where people could race through a maze of rocks and pitfalls to win prizes. It was a good time for all. At last, the Pokemon series was playable online and that meant lots of trading, battling, and scowling at people requesting level 5 legendaries. In a way, online trading took away the fun of collecting pokemon, especially due to the ease of cheating any pokemon into existence. But, on the other hand, battling online was a fantastic way to see new strategies and come to an understanding that there are people far better and far worse than you. And also that chivalry is dead and you will never get a true win without your opponent disconnecting in a fit of rage (this was also the case in MKDS and MPH). Battling in Pokemon Battle Revolution was even better because you could dress up your character to be ridiculous and name them something stupid before beating your opponent to the ground. I wasn't sure what to expect from this one, having not played the GameCube version, but I was pleasantly surprised by the amount of strategy and skill involved in playing this game. 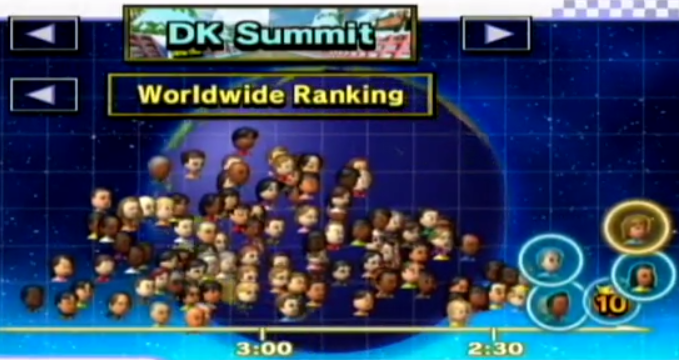 The online points and ranking system gave extra incentive to take the game online and try to be the best. My strongest memories of this game were the frustration of being unable to counter annoying "cheap" tactics and of my friend playing the heck out of it until his rank was amazing. This may be one of the most underrated and overlooked games on Wii, but it's also one that I had some of the most fun with across any platform that generation. I've written about it before, but in spite of its forgettable visual style, Excitebots' gameplay is incredibly satisfying and unique. 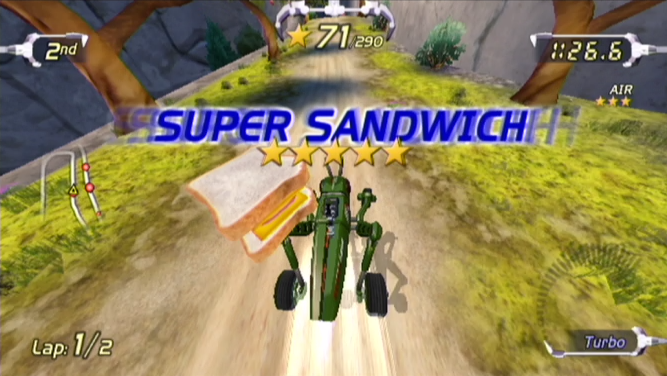 Playing online offered a point system like Mario Strikers' and also had unlockable avatars and vehicle skins to show off to your competitors. It was truly a joy to play. 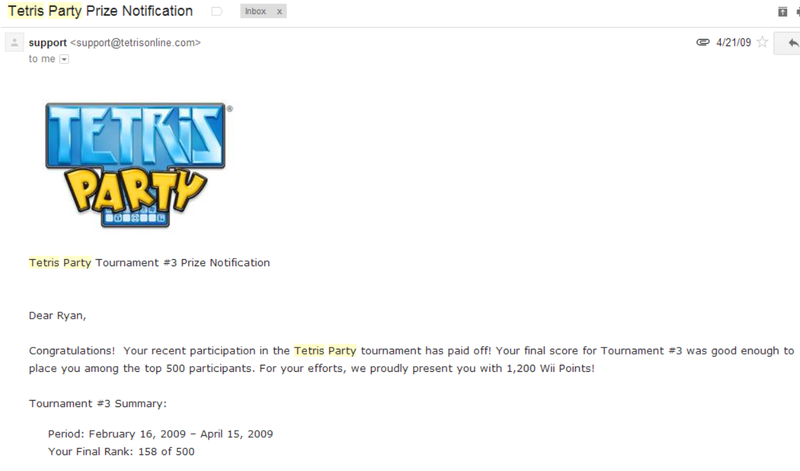 When Tetris Party first came out on Wii Ware, it ran tournaments online and those with the top scores were able to win Wii Points which could be used in the Wii Shop Channel. So yeah, basically you could win real money. In these tournaments, I managed to win back more than the cost of the game and used the extra to play the excellent Art Style games. Even after the tournaments ended, Tetris Party offered a fantastic way to play the timeless puzzle game that managed to draw me away from the addicting Facebook app. So what if the motorcycles were overpowered and the graphics were kinda meh; Mario Kart Wii improved the online play of Mario Kart by leaps and bounds. Out of everything though, I most enjoyed comparing my Time Trials records with the worldwide bell curve and participating in the limited-time tournaments on modified versions of existing tracks or entirely new courses. As always, I also liked watching my rating go up as I won more races. Perhaps the coolest thing was all the custom tracks that could be hacked in and played online. Unfortunately, I never got around to playing them... until today!! So, uh, yeah, I should probably get playing those since my time is running out. Here's hoping the modding community finds a way to bring the Wii (and DS) back online through other means. Ha. Playing online in Brawl. I tried that like once. These were my memories, but I want to hear yours too! Leave them in the comments; I won't judge you if you cry as you reminisce. Alas, the life of a game is too brief.